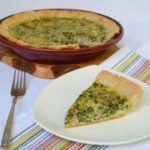 A recipe for a homemade quiche made with ham, spinach, eggs, and cream. In the bowl of a food processor fitted with a knife blade, add the flour and salt. Pulse 1 or 2 times to combine. Add the diced butter and pulse 5 or 6 times. Slice the lard into chunks and add to the mixture. Turn on the processor and add most of the water. Remove the cover and check the dough. When it is done it should appear like small clumps and will hold together when you press a handful together. Add more water if needed and pulse. Turn the dough out onto a work surface and press it together. Using the heel of your hand, push clumps of dough (about the size of an egg) out in 6-inch smears. Form the dough into a round disc and wrap in plastic. Place the wrapped disc in a plastic bag and refrigerate at least 2 hours or overnight. Have a 9-inch pie dish ready and set aside. Cut the dough. You only need about two-thirds for this recipe. Re-wrap the remaining dough and refrigerate or freeze for future use. Roll out the dough on a lightly floured surface to a round 1/8-inch thick by about 12 inches wide. Move the dough around as you are rolling it out to make sure it is not sticking to the work surface. Roll the dough up on the rolling pin and un-roll it over the pie dish. Lightly press the dough in place. Pull in 1/2-inch of the dough at the edges. Roll the pin over the edges to cut off excess dough. Push the dough on the sides and edges of the pie dish to an even thickness and up 1/3 inch above the pan. Prick the bottom of the dough at 1/4-inch intervals with a fork. Pinch or press a decorative pattern on the rim of the shell. Cover the shell and refrigerate 30 minutes or more. Cut a square of aluminum foil 4 inches larger than the pie dish. Lightly butter the shiny side. Turn the foil over (shiny side down) and make a pouch of it. Fill the pouch with a dried beans or pie weights. Line the dough with the foil and press it against the edges. Make sure the beans or pie weights cover the entire bottom and are against the sides. Bake the crust for 15 minutes. Remove the foil and beans/weights and prick the bottom again with a fork. Bake a few minutes more until the pastry begins to color and separate from the side of the pan. Cool crust completely in the pie dish on a rack. Drain and squeeze the liquid from the spinach. In a frying pan or skillet, melt the butter over medium-high heat. Add the shallots and sauté until softened. Add the spinach and stir. Cook about 2 to 3 minutes. Season with salt, pepper, and nutmeg. Remove from the heat and cool to room temperature. Add the beaten eggs to a measuring cup and add enough cream, half-and-half, or milk to make 1 1/2 cups. Pour the mixture over the spinach and stir to combine. Spread all but 2 tablespoons of the cheese in the bottom of the pre-baked crust. Spread the ham chunks on top. Pour the spinach mixture over the ham up to 1/4 inch of the rim. Sprinkle the remaining cheese on top. Bake for 35 minutes or until puffed and lightly browned. *The quantities of flours are different because of the unique characteristics of each type of flour. If the edge of the crust has browned in the pre-baking process you can cover the edge with strips of aluminum foil for the first 20 minutes of baking the quiche. This will help to prevent the edges from over-browning. The remaining crust dough can be refrigerated up to 2 days or frozen for several months. You can use store-bought pie crust if you do not want to make the crust. Pre-bake the crust according to package instructions.